Finding out the latest Auto Sleeper News can be quite exciting and especially where new models are involved. The build up to a new model being seen for the first time be it at a show or exhibition centre is great. You may have been looking for an Auto Sleeper layout or certain number of berths for some time. 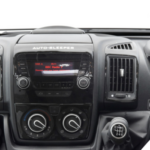 Knowing that you can find out more via the Auto Sleeper News section is no doubt very helpful. When you have been in business for over fifty four years you know that you are doing something right! Letting customers old and new know what you are building and the layouts changing is also helpful. Sometimes just a customers interaction with the factory can make adjustments that are practical and very popular. So, for all the motorhome news and specifically the Auto Sleeper News is of interest. Topical information is always helpful to know especially if you are looking to buy an Auto Sleeper motorhome. The winners of this year’s Tent, Caravan and Motorhome Owner Satisfaction Awards have been revealed, and Auto-Sleepers have been awarded Best Motorhome Manufacturer (UK New and Used)! Club President Julia Bradbury was on hand to present the awards at The Midland Hotel in Manchester on the evening of 17 January. 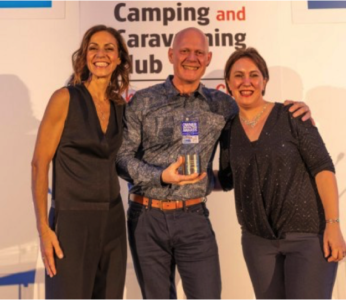 As in previous years, winners were crowned based entirely on the feedback given by the thousands of Club members, Practical Caravan and Practical Motorhome readers who completed the 2019 Owner Satisfaction Survey, which ran from February to November 2018. “This year we introduced a new category – that for Best Motorhome Manufacturer (UK New and Used volume sales). 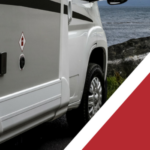 This recognises the British manufacturer that impressed across the board.” It was in this category that Auto-Sleepers took home the award, having been voted the Best Motorhome Manufacturer of 2019! Just been to the Auto-Sleepers factory for 2019 model updates prior to the NEC Show next week. 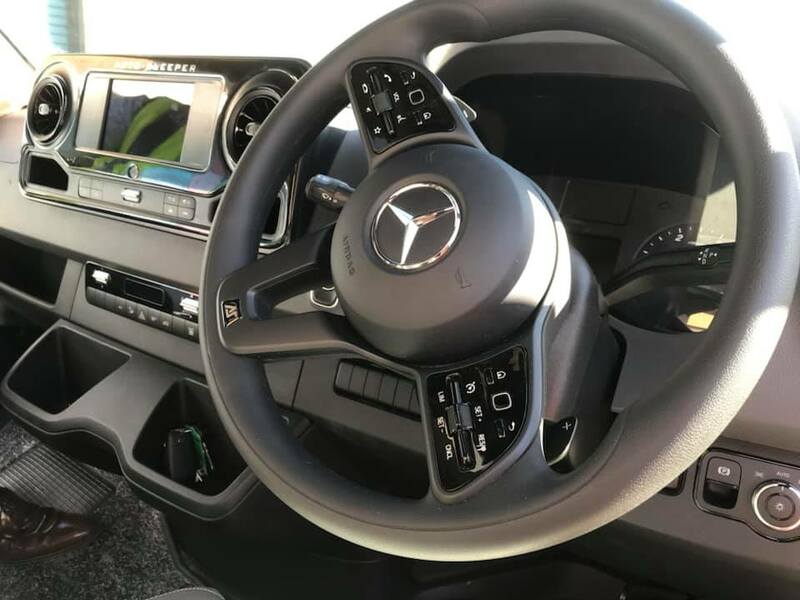 Managed to sneak a few photographs to give everyone a bit of a preview of the new Mercedes range cabs and dash and the latest wood-finish for the Mercedes range too. The furniture finish is called Santana and is lighter than the current Valencia finish, which is still available to order. The dash is very car-like, a huge improvement and there’s also paddle change for the “enthusiastic” drivers; still rear wheel drive and automatic too! New Sargent control panels are very clever, updating them regularly with vital system data bursts. Working on the Auto-Sleepers stand at the Nec next week so hopefully see some you there. It’s always great to have one’s own opinions vindicated by others. That’s why we at Derby Motorhomes were delighted to see award winning Auto-Sleepers motorhomes yet again picking up some prestigious awards at a major show. The Caravan & Motorhome Club Design Awards 2018 were announced recently. This is not just a local caravan association getting together for a cosy informal chat and to exchange subjective opinions. This is a major industry-supported event that was held at the NEC Birmingham on Friday, the 23rd of February. and a whole range of other factors too. The above is not a complete list. The judges were entirely independent and were personally thanked by the Chairman of the Caravan and Motorhome Club for their diligence and attention to detail. Their aims and those of the above sponsoring organization were to make available as much information about the vehicles as possible in an entirely objective fashion. We are long-standing admirers of Auto-Sleepers vehicles. That is no secret! then the Fairford came out top in the “Van Conversions over £55,000” grouping. We believe that these results confirm that we’re not the only ones who have such a high regard for Auto-Sleepers’ constructions. Of course, you don’t necessarily have to just take our word for it. We would warmly welcome your visit and inspection of any of the vehicles we have on site. If for whatever reason, that’s not convenient for you, you could have a look around from the comfort of your own home. That’s thanks to the new “virtual reality” facility that you can find on our site. Don’t worry – you won’t need goggles, special VR headsets, a PhD or “Starship Enterprise” type technology to use it! Most PCs or other mobile devices should allow you to have a good look around some of the Auto-Sleepers products perhaps without even leaving your own armchair. Of course, the most obvious answer is nothing to do with our satisfaction at being right in our original views on award winning Auto-Sleepers. In fact, the results exist to help consumers to decide which vehicles are likely to be the most suitable for them and to reduce their risks of getting things wrong – thanks to the fact that a panel of experts has given a very close examination and subsequent thumbs up to these vehicles. That’s why we are pleased to publicise these successes and to encourage you to check out the vehicles concerned and others from the same stables. We’re looking forward to hearing from you! 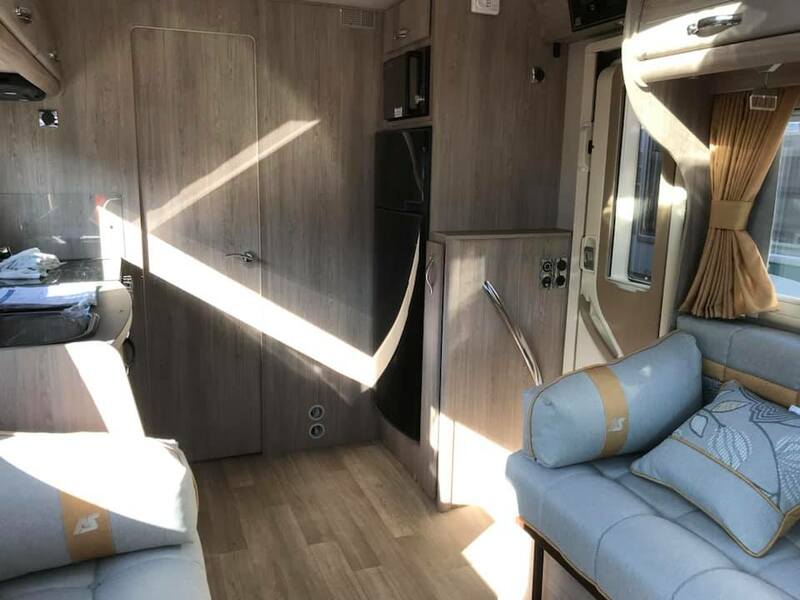 Described on the website Out and About Live as the “mainstay” of motorhome manufacturing in the UK, there is no shortage of reasons for choosing to by an Auto-Sleeper. It’s no accident – but a testament to the build quality and design of their motorhomes – that Auto-Sleeper last year won the Caravan Club’s Motorhome Design Awards in classes topped both by its Peugeot Corinium RB and Peugeot Broadway EB models. 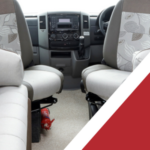 so, we identify every component of the total price you are likely to pay – the basic price, plus VAT, the ex-works price, the cost of delivery (if necessary), the cost of any additional features or accessories you have chosen, and the final, effective price on the road of your Auto-Sleeper. 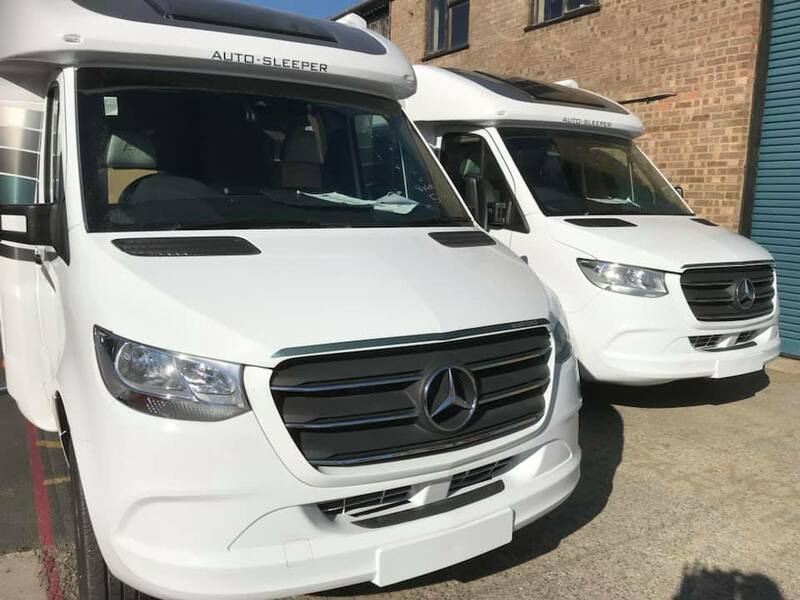 Just as Auto-Sleeper has gained its status as the mainstay of motorhome manufacturing in the UK, so Derby Motorhomes strives to keep its place as one of the country’s leading dealerships. Well, it comes as no surprise to see Auto Sleeper awards winners the coach built Broadway EB and the Corinium RB winning prestigious awards. Yes. scooping not one, but two awards at the prestigious Caravan Club awards ceremony in Birmingham. This years awards coincide with the Caravan Club changing its name to the Caravan and Motorhome Club. In some ways this achievement is nothing new, as Auto Sleepers who have been winning awards over many years. This comes from a long established company who have been in business for over fifty four years. With a vast wealth of experience in designing and making hand built, coach built motorhomes. We here at Derby motorhomes and all of the staff at the Auto Sleeper Centre offer our congratulations. This great achievement again enables us to help promote this great brand of excellence. We are equally happy to see a British motorhome manufacturer win these awards. The ever popular Broadway EB, built on the Peugeot Boxer chassis, scooped the winning prize for the coach built from £51,000 – £65,000′ category. The many long establish Auto Sleeper Broadway owners will not be surprised by this award. The Corinium RB is built on the Peugeot AL-KO chassis achieving the top spot in the coach built over £65,000 category. There seems not stopping the Corinium range a hit from the moment it entered the motorhome charts. The layouts in all of the three current Corinium models certainly provides customers with a choice. The AL KO chassis has been providing Auto Sleeper with a whole new set of options. If you would like to know more about these Auto Sleeper award winners then please let us know. In fact, we extend an invitation to book a personal appointment with a sales team member. We are easy to find and we hold all of the Auto Sleeper range in our heated indoor showroom in Derby. Yes, a question that people often ask is why we like Auto Sleeper? So, a simple answer is we know they have been manufacturing motorhomes for over fifty four years. That speaks volumes about them and just one reason to why we like Auto Sleeper. There are many other reasons mainly because the model range offers something for everyone. From the top of the range Mercedes Benz luxury motorhome to the very flexible Peugeot van conversions. Alongside the Peugeot coach built range and finishing with the all new Peugeot built on the AL KO chassis. Over fifty four years in business. There are other good reasons that we like them for example UK based makes life easy. Parts and servicing issues just disappear most of the time. Yes, there is always an exception but with an Auto Sleeper there are not many to be concerned over. Factory collections and a that easy to get to destination that is in a beautiful part of England. The English Cotswold’s take some beating for a taste of real England. Also, there is a matter of residual values and whilst every motorhome devalues over time, Auto Sleeper remain very popular. In fact, they hold that desirable appeal second hand and the trade likes them as well! We tend to find that they really do sell well. This is also an important factor for all our customers who have an Auto Sleeper. Having the ability to sell an Auto Sleeper quickly is another good reason, should peoples circumstances change and cash be needed in the bank then we would always be a potential buyer. Just ask happy to help anyone. So, there you have some of the reasons that we like our Auto Sleeper. One sound financial reason is that now they are part of Trigano one of Europe’s largest Leisure groups. Now in the sixth year the Auto Sleeper Exhibition Centre continues to go from strength to strength. Following on from record sales of new Auto Sleeper motorhomes in 2016. The company continues to develop the new technology and promote their social media platforms. Now get that seat belt on and relax while we demonstrate our services. The start of 2017 has seen the company develop a very new website and trade as Derby Motorhomes. This will become the motorhome marketing strategy. Brought in to enhance the growing number of enquiries from the website. In Derby in the UK. The company has been very innovative from introducing the idea of a dedicated centre for one manufacturer. They have developed new sales of Auto Sleepers using their indoor showroom in Derby to display all the models. This has created a friendly but professional environment for customers to see different layouts in their own time. On site is full after sales services and no bad weather to brave. The work has been carried out by Speedie consultants a PR company renowned for its social media expertise. They have designed a new website that will act as the platform of Auto Sleeper information. With interaction of stock information and a log in for customers and lead introductions and tracking. This has been the turning point to drive the business forward. PR specialists in the UK. 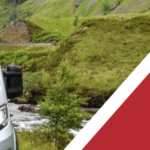 “We have vast experience in finance and insurance lead generation, something that we will adapt to help the Derby Motorhomes brand to tap into. Also, we see the leisure market expanding at a rapid rate so the timing is right”. In fact, there will be other plans to develop further customer friendly leads and integration with customers old and new. Something that the Derby Motorhomes branding can add value to. So, exciting times ahead in Derby.